A wall "segregating" children from adjoining private and social housing is being taken down. Henley Homes, which is behind the development in Kennington, south London, said on Wednesday it had no objection to all residents using communal play areas, having previously insisted access was restricted. It has now confirmed it was "opening up the access between the two sites" following a "positive" meeting. Residents have welcomed the move. Jane Bloomfield, 43, a private owner on the Baylis Old School estate, said she was "pleased to see such quick action". She told BBC News: "I really hope this signals a much more collaborative way of working between all groups to help serve the residents, and children in particular." However, she added there was a small minority of "aggressive" private owners who were not happy about the news. "We always knew this would be a really emotive issue and that some people would not like this approach and decision, but it was never going to happen otherwise," she said. "I can only hope with time that everyone realises that this is a good thing." 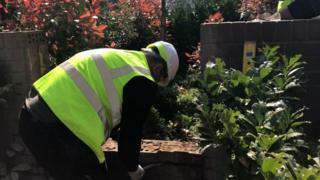 Henley Homes said the decision to dismantle the wall followed a "positive meeting" on Thursday evening with the Guinness Partnership which manages the Wren Mews - the social housing side of the development - and Warwick Estates which manages the Baylis Old School estate of private owners and shared ownership residents. It said it agreed a "fair and proportionate service charge contribution" from the Guinness Partnership which would "allow the residents of Wren Mews to use the play areas and external communal amenities of the wider estate". The Guinness Partnership said it would bear the extra costs. A spokesperson for company said: 'We are pleased our customers now have access to the play areas at Baylis Old School. Thank you to everyone for their support in making this happen." Warwick Estates has been approached for comment. Lambeth Council, which voted through the development in 2013 but said it did not approve any plans for segregated access, said it welcomed the move. "We will be monitoring and holding them to account and continue to challenge requests to segregate communal areas on new developments using our legal powers, including enforcement action where necessary," a spokesman added. Communities secretary James Brokenshire who previously condemned the restrictions "in the strongest terms" said he was "pleased common sense [had] prevailed". He added: "Segregation has no place in today's society and should be rooted out, from the playground all the way to the heights of power."